"This is a delicious and super easy appetizer to make. 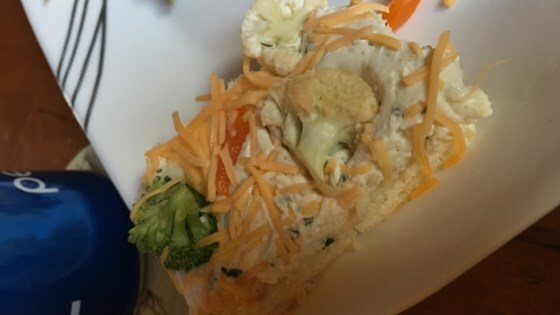 Served cold it is also sometimes called 'veggie pizza.'" I've made this and another similar recipe and it just never gets eaten. It tastes good, but I think it's a little heavy for my/our tastes. It also doesn't sit well and gets soggy. I found it easier to serve this dish if you cut it into sqaures before you put the veggies on. Make this recipe for all parties. I go to the grocery salad bar for the vegetable topping. It's much easier and no waste!! Excellent. I brought this to a shower and everyone loved it. So simple, yet very delicious. Thanks for sharing the idea. I used low-fat cream cheese and low-fat mayo and it was tasty. I only made 1/2 of this recipe, using 1 tube of crescent rolls. Everyone loved them and wanted the recipe. A big hit! Big hit, used a packet of ranch seasoning instead of all the separate spices, and added red peppers.